Apparently, Ivanhoe won the prize for hottest place in NSW in 2007 (with 46.2 degrees a couple of weeks ago). Actually, it feels strange to say this but it’s not all that bad. As long as you don’t try to hang out the washing in bare feet (you only do that once), and you stay inside with the air conditioner/s on. Of course I, on the other hand, was outside in the heat pulling up Cats’ Heads before they died and their very nasty thorns fell everywhere. Actually, while the locals (now including me) refer to them as Cat’s Heads, according to Wikipedia their real name is Goat’s Heads or Puncture vines. Whatever you call them they’re very painful when trodden on – as the Bear will confirm. This month we received lovely surprise visits from Dee and Grant, followed closely by Trudie, who suffered a very long train trip, which was prolonged by an hour and a half (10 ½ hours turned into 12 hours) due to the danger of the heat buckling the tracks. Apparently this is a regular occurrence out here but I suppose it beats a derailment! It was very nice to have a reason to stop weeding, relax and enjoy some R and R (my second New Year’s resolution). Our little red wagon is causing us more grief at the moment. It needs a new harmonic balancer, timing belt and ‘special bolt’ (mechanical talk) so we’ve booked it in at Hay for Monday. We’ve been quoted ‘$1300 plus’ provided they can finish it in one day, otherwise we have to add accommodation costs! And, after searching for months, I have finally bought a trailer, which Lee and Col were good enough to pick up for us on the Central Coast. In February Nigel and I will head over to fill it with some furniture from Dee and Jan as well as a couple of items I bought. Who said that living in Ivanhoe might dampen my ebay addiction? Thanks to the rain, there was no mail yesterday. In fair weather, mail is delivered to Ivanhoe Post Office on Monday, Wednesday and Friday. The mailman arrives by ute from Wilcannia and he really does go all out to deliver it. But the road between Ivanhoe and Wilcannia is a dirt road, so forget the “rain, hail, sleet or shine”. It’s the mud that’ll get you every time! 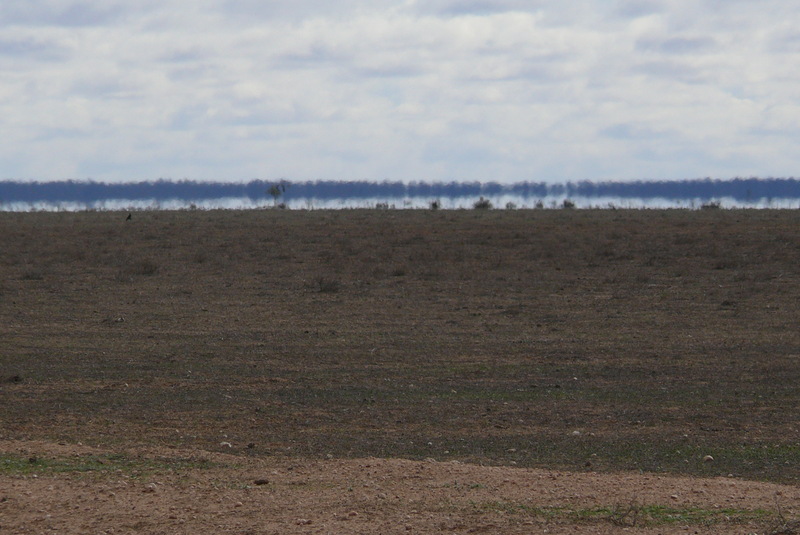 Speaking of which, a previous Ivanhoe resident was traveling to Ivanhoe on the Hillston Road, which is also a dirt road, when he spotted what he thought was a mirage – which is not all that unusual. What was unusual was that he drove straight into it and became bogged, because there actually was water on the road. His truck stayed bogged for most of the day until a farmer towed him out with his tractor. Moral of the story? Mirages aren’t always what they seem.